SKU: FLMSL. Category: Log Flame Retardant. Tags: flame retardant, flame seal, log finish, log homes. Flame Seal Wood Seal-A Fire Retardant is an application ready, water-based, Class A fire retardant designed for treatment of raw wood. Flame Seal Wood Seal-A is a mix of proprietary ingredients, which forms a slight swelling foam layer and carbon char when the treated wood is exposed to fire. Once the carbon char is formed there will be minimal flame increase, smoke evolution or afterglow. The retardant is designed for interior use only. However, Flame Seal Wood Seal- A can be used in exterior applications if top coated with an approved non-flammable paint or coating. Uses: Flame Seal Wood Seal-A is designed for use on unpainted / unsealed wood, paper or other cellulose type materials. Water-based, low odor, non-toxic, non-hazardous and contains no halogens. Applied by brush, roller, spray and submersion methods to unpainted / untreated wood, paper, or other cellulose products. The surface must be able to absorb the water based fire retardantto provide fire protection. Interior walls do not require a stain or top coat. Exterior surfaces should be stained with a compatible, non-flammable stain or top coat after treatment with the retardant. The official ratings given for this product was from testing on Douglas Fir, which is considered the standard for testing. Tested on Douglas Fir in the ASTM E84-05 (Steiner Tunnel) flame spread test. Slows flame spread and prevents fire from propagating along the treated surface, which also reduces smoke production. Coverage rate should be 150 – 350 square feet per gallon as determined by porosity of wood and on wood that has no Mill Glaze. Clean, dry, bare wood free of mill glaze. X-180 Weather Wood Restorer will remove mill glaze. Apply ample Wood Seal- A retardant to saturate the wood by brush, roll, and spray or submerse both sides, if possible, to unpainted / untreated (do not apply to pressure treated) wood, paper, or other cellulose products. Mix thoroughly before use. Use with adequate ventilation· Dries clear and odorless. Minimum application temperature is 60 degrees. Warmer temperatures result in better penetration. Minimum 24 hours depending on temperature and humidity. Retardant must be allowed to penetrate the wood and to thoroughly dry to be effective. Excess retardant should be removed before drying. Interior walls do not require a stain/top coat. Exterior walls require a compatible stain or top coat after treatment with retardant. Note: some stains and top coats are flammable due to oil and resin content and can adversely affect the flammability of the Flame Seal Wood Seal- A treated substrate. Temperature Range: 40 °F to 90 °F. Once fire treated the material should not need to be treated again, unless it is not sealed and is exposed to surface moisture or high humidity for an extended period. The Wood Seal Class A Fire Retardantmust be used in its “undiluted” state. Brush, roll or spray both sides of wood sample, if possible. Apply ampleWood Seal-A retardant to saturate the wood. Some residue may remain on the surface, especially if heavily applied. Remove excess retardant with slightly dampened cloth before completely dry or fine sanding, if necessary for staining or fine finishing. Allow a minimum of 24 hours to dry, depending on temperature and humidity. Test burn with a flame or torch to check that the wood does not continue to burn when the flame is removed. The Wood Seal-A Fire Retardant must be used in its “undiluted” state. Apply Wood Seal-A Retardant to the wood by same method as the successfully tested sample. Coverage rate should be 150 – 350 square feet per gallon. AllowWood Seal-A to dry minimum 24 hours depending on temperature and humidity. Non-flammable paint or coatings should be applied after Wood Seal-Ahas dried if wood will be exposed to water or used outdoors. Many factors contribute to the flammability and treatability of different wood varieties such as oil and resin content, moisture content, the ability to absorb these water-based products, etc. Therefore, Flame Seal Wood Seal- A will not achieve the fire listed ratings on all woods. As such, some woods are much harder to fire treat than others. The official ratings given for these products were from testing on Douglas Fir, which is considered the standard for testing. It absorbs liquid fairly well and has an untreated Flame Spread of 90 to 105. Comparison charts of flame spread rating for most wood types are available on the internet. Any flame spread ratings to be met or claimed must be determined by the customer. Note: Test results are available regarding Flame Seal Wood Seal-A’s class A fire rating. Please click here to see them. Wood Seal-A’s Class A fire rating was achieved on Douglas Fir. Other woods of a similar, or lesser inherent fire spread rating, and penetrability, when properly treated should meet Class A fire testing requirements. There are no other warranties either expressed or implied since Flame Seal Products, Inc. cannot control the actual application of the products. Users must determine usability and suitability for their particular requirements, as well as compatibility with the exact materials to be treated or coated. Exception: An Expanded Warranty is available for work performed by Certified Applicators. To test for general adequate treatment, apply a flame or torch to a sample of fire retarded material. If the flame does not spread rapidly away from the heat source and goes out soon after the heat source is removed, then your material is probably sufficiently treated. If you are trying to meet code, check with your local fire marshal as to what is acceptable. You may have to pass third party testing. From a Flame Seal customer in Tujunga, CA, site of the famous Station Forest Fire in 2009. It turns out this was a lucky, or perhaps prescient, move on our part. Four months later, on August 29, 2009, the Station Fire consumed more than 50 of our neighbors’ homes. This fire eventually became the largest blaze in Los Angeles County history. While we watched the devastation we didn’t have much hope for our cabin, but two days after the fire ran through, we were allowed to return and see to our amazement that our house was still standing! There were a thousand tiny burn marks all over the surface of the deck where embers landed, and the back of the house, which was also treated with Flame Seal, had bubbling paint and a warped plastic thermometer, but none of the ignition points sustained burning. We were so pleased; we bought another five gallons to seal the entire surface of the house, which had to be repainted after the fire. May be shipped throughout the United States by Fed Ex ground and internationally. 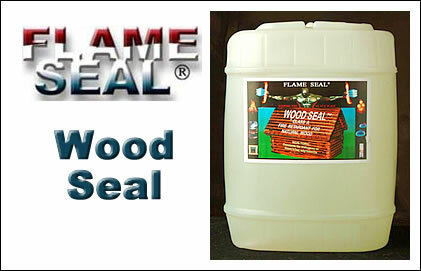 Be the first to review “Flame Seal Wood Seal-A Fire Retardant” Click here to cancel reply.